My wife and I had our first child recently, and didn't wait long to introduce her to the St. Croix River. My wife Katie and I welcomed our daughter Annika Marie into the world on March 1. Two weeks later, we introduced her to our beloved St. Croix River at William O’Brien State Park. Our trip to the river was on one of the weirdly warm days lately, and the water was largely open. 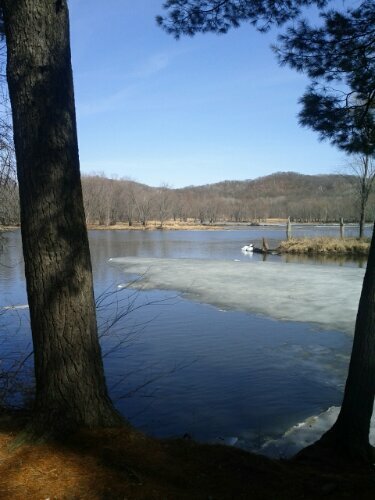 Big ice floes were floating downstream, occasionally crunching into each other. We didn’t walk far, just a couple hundred yards down the trail to some favorite white pines, where we snapped photos and breathed in the spring air. On the way home in the car, we talked about when a person could realistically first take a baby for a short canoe trip.